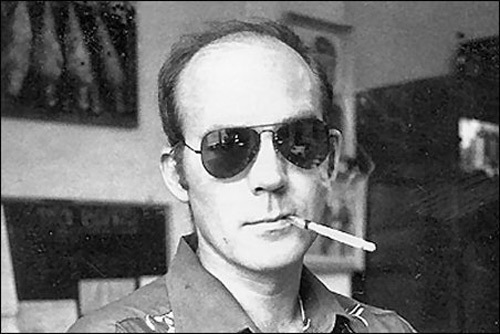 Reading Hunter S. Thompson’s “Fear and Loathing in Las Vegas” changed my life. Not because he was a literary genius, or because the book was so funny I couldn’t read three pages without laughing hard. I realized long before I got to the end that I wanted to know how much of this story was true and what was made up. How far did he really go before he started typing? Where did reality end before Hunter’s imagination began? The book itself was a page turner, and the story behind it had me obsessed. Around the same time I began to apply the same concept to my sales calls. What if I could create enough curiosity in a prospect that they’d take an initial demo? What could I do on a demo that would make them truly want me to keep going? Most sales reps are focused on developing other things. Rapport, interest, buy-in. Are these things important? Absolutely. However, there each one of those is missing something crucial. They’re all missing a human element. Something that compels a prospect to want you to keep going because they want to know what’s going to happen next. That human element was something I had found in Thompson’s writing, which was finding it’s way into my sales conversations. What would the prospect love to know more about? They’re all about how the sales rep makes the call and gets the result. Me me me me me! Good question to ask: Who ends up making the buying decision, you or the customer? Notice I said buying decision, not selling decision. Customers are the ones who buy things. So why are we so damn focused on how do we make the people we want to buy from us do the things we want them to do? Why not focus on enabling them to make a smart decision around what we have to offer? Yes, it’s frightening to think this way at first. Once you realize that’s the way it already is, the concept becomes a bit easier to swallow. That first step down the process is driven by one of two things. Either the prospect is actively seeking to make a change, or the prospect is open to learning more about alternative ways of doing things. Think about it for a moment if you don’t agree (skip this paragraph if you get it). When someone tells you about a solution that can help you out, unless you have a fully developed need, like a burning need where you need it fixed right this second, are you going to go buy it? No, you aren’t. However, you might be curious about what it is, and you will be curious about something long before you buy it. Therefore if you’re doing outbound prospecting of any kind, you’re going to encounter a lot of people who are open to learning more but aren’t actively seeking to make a change yet. With that in mind, let’s take a step back and talk about what the purpose of a prospecting call is. 1) Start to understand the prospect to see if your product or service can help them. 2) If it can, create enough interest so the prospect chooses to learn more. Most training is focused on the first part, getting to know someone. In fact, a lot of sales advice is around rapport building, developing a relationship, and digging deeper into a prospect’s needs, wants, and desires. So little sales training focuses on creating a conversation that the prospect actually enjoys being lured, even seduced, into having. What’s missing is the soft skills that help you get the prospect curious enough to take the first step in the process. It’s skipping over how to create enough curiosity that your prospect is actually engaged on your demo. Too little is focused on the setting up and unveiling your proposal so the prospect is captivated, intrigued, and pleased. Instead everyone wants to talk about the methodology on how to pitch a prospect on your first call. How to ask questions, likely after regurgitating 20 minutes of memorized product knowledge. Then how to negotiate price because the prospect doesn’t see the value in what you have to offer. It’s not a coincidence that performance means both entertainment and results. Prospects don’t want to be sold to, they want to go for a ride. No matter what happens they want to walk away with a story to tell, because that’s what everyone else will want to hear. The first step is getting them curious. You might be asking yourself, how do you define curiosity on a sales call? That question has a bit of suspense and desire to it. Enough for the prospect to want to see what happens next. If your goal is to set up an initial sales call to truly introduce your product, how can you create a sense of curiosity? Seriously, how often does anyone fully understand a product in 5 minutes or less? An engaged and informed prospect is much deeper into the buying process, whereas a curious prospect is ready to take a first look. You’re curious if the restaurant your friend recommended to you is really good. You’re interested in dinner. That’s the difference between the two. People buy dinner but are curious about restaurants. And you’ll go to the new restaurant if you want to tell the story of what it was like going there. Buy the ticket, take the ride. Going to the restaurant for the first time is like getting someone to agree to and show up to a first demo. Becoming a regular is like turning them into a customer. How do you translate this into getting someone to agree to a demo? You need to create a gap between what they’re likely interested in and what you have to offer. It’s how you tell a story. The hero wants glory, and he sees where it is, but he doesn’t know exactly what will happen on the journey between where he stands and where he’s headed. That’s why we read the story, to see what happens on the way there and once the hero reaches the other side of the gap. If you’re wondering, how do I apply this to a SaaS offering? – great question. Most SaaS products are things people already do, have, or spend effort on. They’re interested in sales analytics. They’re interested in having a central record for each patient that’s updated in real time. They’re interested in having an email platform that can send drip campaigns and track what the recipients do. They’re curious about what you do and how that might be better than what they’re already doing. And they’re curious because of the gap between what they’re currently doing and what you’re talking about. You need to find people who are curious about what’s out there. You need to target people who are interested in what you have to offer because they already value it. Interest leads to buying, and long before that curiosity leads to people taking a look. The whole purpose of prospecting is to get people to take a look at what you have to offer. Think about what that gap is between where your typical customer is when she first talks to you and where she will be after she buys. How can you articulate that? What story can you tell around it? How can you frame the ride (demo) so your prospect wants to buy a ticket? Once you can perform well enough to get ready to ask the prospect to buy that ticket and take that demo you have to ask them to buy the damn ticket. How to close a demo is another post in itself, but let me leave you with one idea on what you can say. Yes, I’ve said this before – and if you’ve done everything right up until this point, if you’ve created a gap, if you’ve put on a bit of a performance, it can work. Because if you’ve done your job, it’s hard for the prospect to say no when she really wants to buy that ticket.